An original letter of correspondence between brothers and business partners Joshua Coffin Chase and Sydney Octavius Chase. Topics discussed in the letter include Mr. Parrish's statement of federal inspection in New York and Joshua's planned visit to Isleworth Grove. 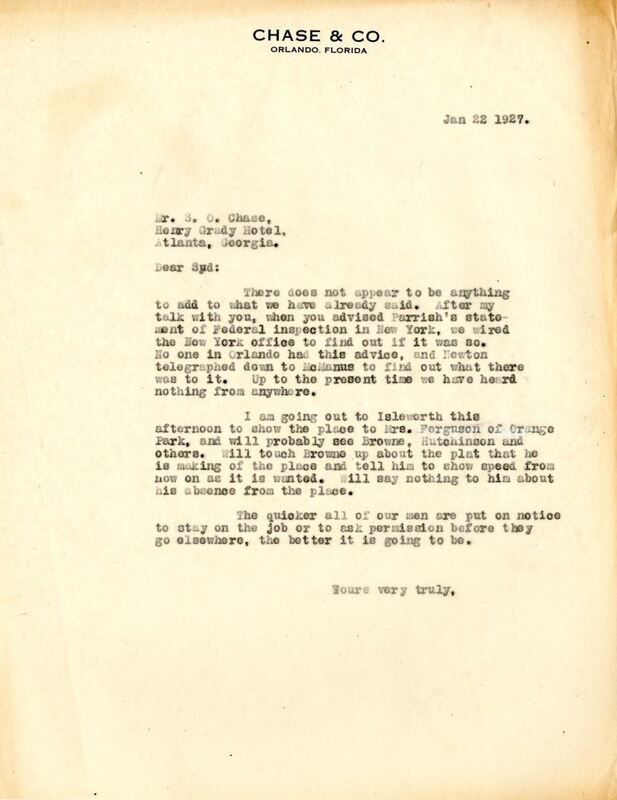 Digital reproduction of original letter from Joshua Coffin Chase to Sydney Octavius Chase, January 22, 1927. There does not appear to be anything to add to what we have already said. After my talk with you, when you advised Parrish's statement of Federal inspection in New York, we wired the New York office to find out if it was so. No one in Orlando had this advice, and Newton telegraphed down to McManus to find out what there was to it. Up to the present time we have heard nothing from anywhere. I am going out to Isleworth this afternoon to show the place to Mrs. Ferguson of Orange Park, and will probably see Browne, Hutchinson and others. Will touch Browne up about the plat that he is making of the place and tell him to show speed from now on as it is wanted. Will say nothing to him about his absence from the place. The quicker all of our men are put on notice to stay on the job or to ask permission before they go elsewhere, the better it is going to be. Chase, Joshua Coffin. 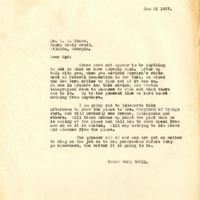 “Letter from Joshua Coffin Chase to Sydney Octavius Chase (January 22, 1927).” RICHES of Central Florida accessed April 24, 2019, https://richesmi.cah.ucf.edu/omeka/items/show/2749.